【CRYTAL CLEAR SOUND】Treble sound fill a room with so much music comes through crisp and clear which provides you a more enjoyable stereo sound experience with this elegant and sleek sound bar speaker. 【SMALL BUT GREAT SOUND】4.3" x 2.5" x 2.5" dimensions saves precious desk space at home or the work office. 6W (1.5 per speaker) can provide quite high sound which is good for cinephiles and music lovers. 【PLUG AND PLAY】USB powered with 3.5mm audio jack connect speakers for audio streaming from your PC or laptop to providing you soft or powerful sound. 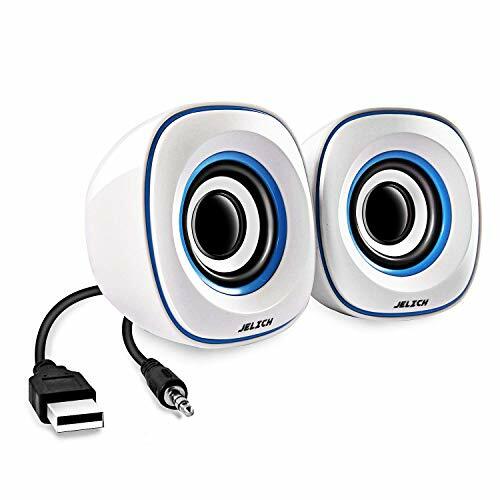 【PERFECT GIFT】JELICH mini computer Speakers works right out of the box with desktop PC's and laptops, Windows, Mac, and Raspberry Pi. It's time for a perfect gift for your loved one.